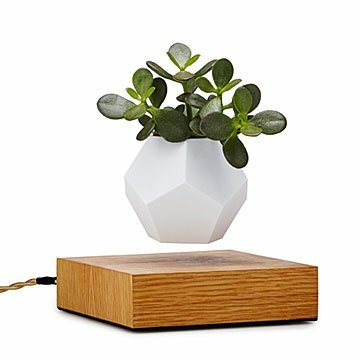 Simon Morris's elegant, electro-magnetically powered planter lets plants float serenely above it all. The common houseplant is common no more. Making possible infinite moments of futuristic zen, Simon Morris's geodesic planter floats—and that is not just a figure of speech. The modernist white plant pot literally hovers above its handsome, sustainably sourced oak base, slowly twirling in mesmerizing suspension. Simon, whose father was a botanist, created this hypnotic design using the natural properties of magnets and electrical current to magical effect. Ideal for air plants, which don't need soil, the pot can also hold up to .5 lbs, for plants that do require a bit of earth to thrive. The wizardry that keeps the pot afloat also makes it rotate, giving the plant equal sun on all sides. A cleverly designed, hidden inner reservoir protects plant roots from overwatering. Designed in Sweden. Made in China. Do not use in wet surroundings.